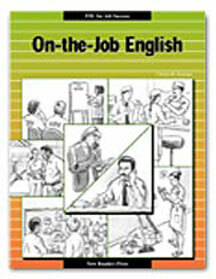 On the Job English materials are developed to the highest standards for student success. Every element from content and instructional approaches to graphic design and illustration attends to the special needs of the intended audience. Theme-based lessons integrate reading, writing, listening, and speaking. Each lesson is set in a familiar workplace context, such as a factory, hospital, or restaurant. Each lesson centers around a conversation or document typical of each setting. Activities encourage work in groups or teams.